How was it to be an all rounder? Being an all rounder was fun. It kept me involved through out. I could not relax at any given moment because I had to contribute in both departments. Having said that it requires a lot of sacrifice and time to work on all aspects of your game. What was special about the 2003 World Cup campaign? Did the team prepare differently? Did the team expect to make it to the Semi Finals? The team did get a lot of practice matches before we went to South Africa. Plus I believe the conditions and the wickets suited us perfectly. Most of us had played together for over ten years so we understood each others strengths and weaknesses. What is your favourite moment in the 2003 WC? Favourite moment is being in the semifinals. It in itself is an achievement that can never be wished away and will remain in the history books forever. What is your favourite moment in your career? 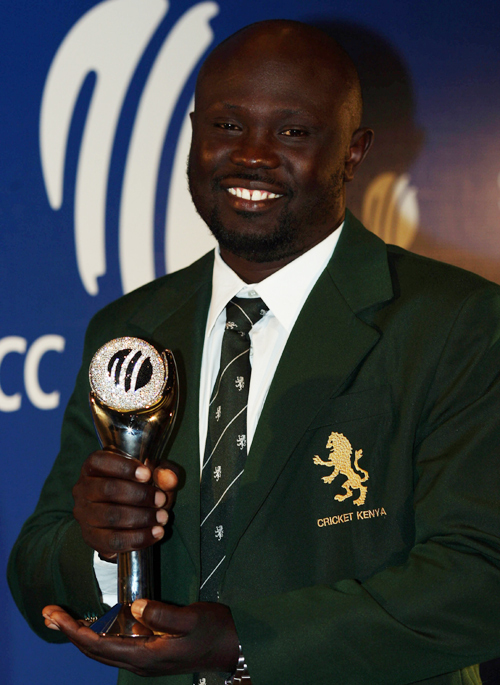 Being named the Associate player of the year in 2007.
Who do you rate as the best Kenyan Cricketer ever? Do you have any regrets with respect to your cricketing career? Regret is that I did not fully utilise my batting abilities. I am taking a break from the game right now. But I hope to join and help with administration in the future. What do you think led to Kenyan cricket's fortunes declining from the high of 2003 WC? What measures are being taken to revive it? Any particular upcoming talent to watch out for? Our cricket structures are poor and continue to be so. Unless we sort that out we will struggle. Age group cricket is key and clear pathways up to the national level. Virat Kohli blamed his bowlers for failing to defend 75 in last 4 overs. It was 66 of 24 in reality. He is well within his rights to be upset and criticise his bowlers. But it was Virat Kohli who was the worst culprit in last night's debacle against KKR. Why ? Let's see. Pacer Saini bowled pretty well for 4-0-34-2. He picked up 2 wickets including that of DK of his last ball of 17th over. But what did others do ? Fast bowlers: 8 overs - 125 runs - 0 wickets - 15.83 runs per over. Spin bowlers: 7.1 overs - 45 runs - 3 wickets - 6.38 runs per over. RCB spinners had put in a magnificent show and picked up 3 wickets too. Yet, they bowled only 7.1 overs of spin. Negi bowling last over was because Siraj and Southee had screwed up big time. Else, the last over would have been bowled by a pacer too. Kohli simply forgot Moeen Ali was alive and kicking. Kohli just doesn't fit as a captain when Dhoni isn't there on field in the shorter formats of Cricket. Youth and Fame – A Deadly Concoction! India’s test series win in Australia is a moment in time, a piece of history, one of the most awaited and cherished wins in memory. This team has shown ruthlessness, consistency and superior performance – let it be the aggression of the pace battery, the run making prowess of Pujara, or the now-used-to consistency with which Kohli scores. But there are talks about how this was probably the weakest Australian side to take field; a team undergoing rebuilding phase – both on and off the field. The absence of Steve Smith and David Warner was no doubt a massive gain for India, but still, Australia managed to win the Perth test. However, what made this series spicy (don’t forget that this series started with no pre-series aggressive comments from the Aussies, and both teams showing mutual respect, which was unseen till now) was the banter behind the stumps. Tim Paine and Rishabh Pant hogged the limelight for their innovative, catchy and sometimes childish comments (can’t call it sledging, as Channel 9 was broadcasting it by asking the commentators on air to be quiet and let the wicket keepers do the talking, as perhaps, for some weird reason, it made good viewing). I wonder what the likes of Richie Benaud would have had to say for such antics! 7th January, 2019: Sydney –a rained out day and not a ball bowled. Yet, it would go down as a red letter day in the annals of Indian cricket. India had finally conquered Australia, the first ever Asian team to do so. It has taken 71 years of toil but we finally did it. Yes, this was the weakest Australian team that I can recall. But it still had a world-class bowling attack which needed a special blunting down by Pujara. And for their batting lineup, missing Warner & Smith, while not a single one of them would walk in to any of the other Test teams, they were a collective pest, scoring 20s & 30s, stitching together little partnerships down to the No. 11. Yet, we did beat them in their own backyard. Something none of the Indian (or Pakstani or Sri Lankan or Bangladeshi) teams had ever done. Our fast bowlers outgunned their counterparts, our batsmen were better at survival and blunting attacks and our wicket-keeper gave it back as good as he got on the sledging front. A 2-1 victory doesn’t really reflect the gulf between the two teams, thanks to the washed out last day in Sydney. While I do not believe in Ravi Shastri’s hyperbole about this being bigger than 1983 or 2011, it certainly is special. After all every India fan carries mental scars of multiple maulings received in Australia over the years. Personally, I recall horror details from the many tours of Australia. 1991-92 – when we were thrashed 4-Nil with a Ravi Shastri double century, which included walloping of the debutante Shane Warne, in Sydney nearly winning us the game. Then there was Sachin Tendulkar’s coming of the age kind 100 at Perth. But we were smashed in every other game. 1999-2000 – A 3-nil thrashing, which was the actual prediction of the Mr. Niranjan Shah, the then BCCI secretary. The highlight of the series was a VVS Laxman 163. It didn’t affect the result in one bit but it was the first sign of the torment that VVS would unleash on the Aussies. This became part of the 16-game winning streak for Australia, which ended in Eden Gardens at the bats of Laxman and Dravid. The tide had started to turn. Missing Warner, Smith and Indian Lineup ! Some Australian Commentators are lamenting the absence of Warner and Smith and claiming the series defeat is because Australia were weakened, thus trying to take the sheen off a brilliant series win achieved by India. Let us take a look at Indian team too. India played the entire series without their first choice opener Prithvi Shaw. Their best all rounder Hardik Pandya too was missing, significantly upsetting the balance of the team. India's first choice spinner Ashwin missed all but first test. India's second choice spinner (Jadeja) was forgotten till the second test ended. India played first two tests with an opener under probationary training before retirement (Murali Vijay) and a specialist slip fielder (Rahul). Third test had one and a half openers and fourth test had one opener in Mayank Agarwal, who was imported as an afterthought. India's problems didn't end there. While Coach Shastri was expected to deliver overseas, it was Rohit Sharma's wife who delivered at home and even he took off during final test, bringing the specialist slip fielder back. India's middle order had Rahane making guest appearances as if he weren't paid his remuneration and then Rishab Pant was enjoying his Australian holiday with baby sitting tips, till the final test. India's tail forgot what it means to wag in the first half of the series while the second half didn't necessitate the tail at all. Australia just missed two of their best batters. With one Pujara, two thirds of Kohli, less than half Rahane, full Pant, imported opener and 3 deadly fast bowlers, India have won their first series down under. Imagine what a full strength Indian team would have done !